There are echoes of Amos (and other prophets) in Mary’s song, especially in relation to God’s compassion for and provision for the outcasts, the poor, and the oppressed. As you read both scriptures this weekend, may we join in Mary’s song, and let our voices sing out for the oppressed. But I’m really writing to introduce the first contribution by a new guest writer, Dena Dyer. Dena sent me this contribution months ago and I knew it would line up perfectly on this day, so I’ve been impatiently waiting for the chance to share it with you. Dena is a friend from seminary days and has a wonderful voice, both as a writer and a singer. You can follow her and find out about her other writings at her Facebook page. I look forward to sharing more from Dena in the future. When my friend Renae invited me to her country home for coffee and conversation, I eagerly accepted. After a long, refreshing talk, we toured the land around her house. Her husband, a teacher and part-time landscaper, had created several lovely sitting areas and interesting out-buildings around the property. Not far from the house, Renae pointed out a small pond. “We built the duck pen first, but later decided to build homes for the birds. We wanted to keep them safe when they enjoyed the water,” she said. I exclaimed over the craftsmanship of the two small abodes. The first was built to look like a Japanese pagoda. A foundation had been laid on four stilts, which secured the building to the pond floor. Tiny wooden steps led from the base of the duck house to the upper level, which was covered by a large peaked roof. It was beautiful, well-built, and practical. “What? Are you serious?” I asked. She nodded. It struck me later that God is like Renae’s husband—a master craftsman who has given us everything we need. His gifts are beautiful, well-built, and practical. However, we are like the ducks. 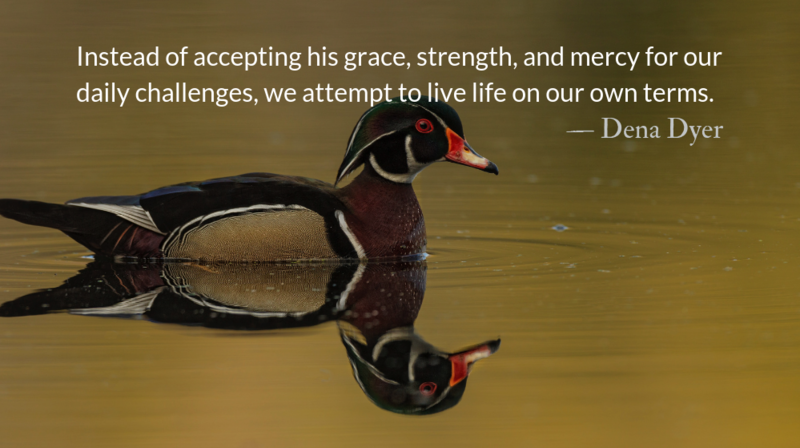 Instead of accepting his grace, strength, and mercy for our daily challenges, we attempt to live life on our own terms. Then, when Satan throws hardship, temptation, or other spiritual arrows at us, we are vulnerable. Often, we get eaten alive. I want to be more like Mary and less like a stubborn, silly duck. When God sent an angel to the young Jewish girl, Gabriel told her that he had chosen her to be the womb for the Messiah. In faith, she accepted that her heavenly Father had favored her above every other human being. She trusted him to provide for her in a myriad ways and leaned on him to give her strength throughout Jesus’ birth and life. She lifted the name of God high, instead of lifting up thousands of questions, as I would have been tempted to. Has God granted you a spiritual gift that you haven’t opened out of rebellion or apathy? Confess that to the Lord, and make things right with him. Has there ever been a time when God protected you from something because you trusted in him and followed his commands? How can you encourage those in your community to seek shelter with God this week? *This devotional was originally posted as a part of The High Calling devotional series. To you, O Lord, I lift up my soul; my God, I put my trust in you; let me not be humiliated, nor let my enemies triumph over me. The growth of Jesus in Mary’s womb symbolizes his growth and gradual manifestation in our lives. Mary lent Jesus DNA, and cells, and tissue—her body knit him together and delivered him into our world. Mary lent his Spirit flesh. Jesus gives our flesh Spirit. Mary, and Joseph after her, answered, “yes.” They accepted the danger. They accepted the unknown. They accepted the world-flipping power shift that would start with Mary and be concluded by her first-born son.